Mitt Romney continues to surge in the FiveThirtyEight forecast, and Friday may have featured his best set of polls all year. The best way to track a change in the polls is to look for instances in which the same firm has surveyed the same state (or the national race) multiple times. The FiveThirtyEight forecast model relies on a procedure very much like this to calculate the overall trend in the race. Fifteen polls were released on Friday that provided a comparison with another survey conducted between the Democratic convention and last week’s debate in Denver. Mr. Romney gained an average of 4.6 percentage points in these surveys. That is actually a bit larger than we were showing earlier in the week, when the same exercise put Mr. Romney’s postdebate bounce more in the range of three or four percentage points. It is not clear whether Mr. Romney is still gaining ground — or whether he benefited from a couple of outlying results. The median change in the polls, which will be less sensitive to potential outliers, was a three-point gain for Mr. Romney, more like earlier in the week. But unlike earlier, Mr. Romney is now seeing some of his best results in swing state polls. Six of the seven polls published on Friday from such states had him ahead. Thus, just as the hypothesis of a fading Romney bounce was damaged on Friday, so was the idea (which we critiqued in an earlier post) that his gains would be more modest in the swing states. It might be noted that some of the state polls released on Friday were from firms that have had Republican-leaning results, and they might slightly exaggerate his standing. It is unlikely, for instance, that Mr. Romney would win New Hampshire by four percentage points right now, as implied by an American Research Group poll of the state. But even polls that are Republican- or Democratic-leaning can still be useful in detecting the race’s trend, and it is one that clearly favors Mr. Romney. Because our forecasts are made on a probabilistic spectrum, we do not place a major emphasis on the idea of “calling” states, but Mr. Romney’s probability of winning Florida crossed the 50 percent threshold earlier this week. He got two more strong polls there on Friday, bringing his chances to nearly two in three. 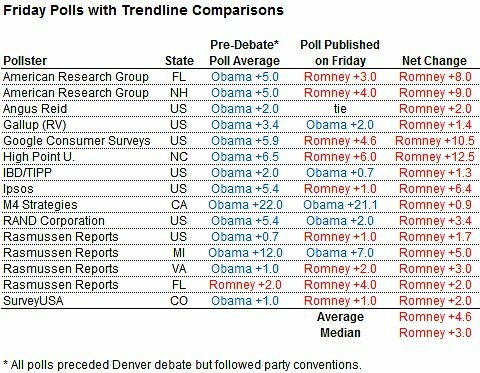 Mr. Romney became the slight favorite in Colorado in the forecast on Thursday, and the slight favorite in Virginia with Friday’s update. The forecast model is being very aggressive about pricing in Mr. Romney’s gains. In our “now-cast,” he’s added a net of 4.8 percentage points since the debate. He will need to have more strong polling days like Friday to maintain his current standing in the model. But the FiveThirtyEight forecast of Mr. Romney’s chances — 38.9 percent — is nearly identical to the one at the betting market Intrade, which put them at 38.5 percent as of early Friday evening. Other prediction markets and bookmakers give Mr. Romney slightly lower chances, in the range of 30 or 35 percent. Were there any bright spots at all for President Obama in Friday’s data? He did gain ground in two national tracking polls, from Ipsos and Investor’s Business Daily, although he lost ground in two others, from Gallup and Rasmussen Reports. The Ipsos poll is interesting in that it was the only one to include a substantive number of interviews after the vice-presidential debate on Thursday night. (Ipsos conducts some of its online sampling late in the evening and early the next morning.) That poll showed Mr. Romney’s national lead narrowing to one point from three. Still, the clear majority of its interviews preceded the vice-presidential debate. It will take a couple of days to determine whether it had any impact on the polls. The only really good news for Democrats is that Mr. Obama had built up a large enough cushion that he could withstand a lot of damage without becoming the underdog. The forecast model still has him clinging to narrow leads in Ohio, Iowa, Wisconsin and Nevada, states that in some combination would give him 270 electoral votes. Mr. Obama may also be just slightly underperforming the fundamentals in the election. His approval ratings remain near 50 percent, which would ordinarily predict a narrow re-election victory. Some of the more visible economic numbers, like monthly and weekly jobs reports and consumer confidence figures, have also been stronger lately. None of this is to say that a rebound is certain. It is late enough in the race that the polls need to be taken more at face value. The forecast model adjusts Mr. Obama’s numbers up slightly based on its economic index and his incumbency status, but only by about 0.4 percentage points. It may also be that he will need to earn those lost points back — rather than expecting them to return automatically — with, for example, a stronger performance in the last two presidential debates. In the same way that Mr. Romney had a wind at his back before the Denver debate, in that the four- or five-point lead that Mr. Obama held at that point was higher than might be expected based on economic conditions, Mr. Obama might have more to gain than to lose in the final two events. Yet some of the plausible arguments that Democrats were making earlier in the week about Mr. Obama’s standing — like that his position would be more robust in the swing states — are looking weaker now. Although we prefer to describe the race in quantitative rather than qualitative terms, the nomenclature that we use in our Senate forecasts is to describe a race as a “tossup” if each candidate has at least a 40 percent chance of winning. Mr. Romney is on the verge of that threshold.